Who Was Bartholomew In The Bible? Not much is said of the Apostle Bartholomew. Who was this apostle and why do we need to know about him? 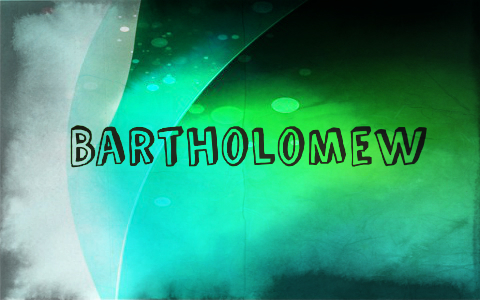 The Apostle Bartholomew was one of the twelve disciples, later named apostles of Christ. We know precious little of this apostle because he was so infrequently mentioned in the Scriptures. Even so, since he was one of the apostles, he must have had significant importance to the work of the church or Christ would have never called him in the first place. He was sometimes called Nathanael which is a Hebrew name meaning “God has given” and since we know that frequently in the Bible, God names people for certain attributes, this name is no accident. Philipp was the one who introduced Nathaniel to Jesus (John 1:43-51). Philipp, like Andrew, seemed to have a propensity or tendency to bring others to Christ. His given name “Bartholomew” is from the Aramaic “bar-Tôlmay” and means “son of Tolmay” or “son of the furrows” which could mean that he was the son of a plowman or farmer. Bartholomew was born in Cana in Galilee which being outside of Jerusalem, may have been a farming community and served as an important region that produced commodities that were essential to the people in Judea. As I wrote, Bartholomew was introduced to Christ by his friend, Philipp. His initial reaction to Jesus was skeptical since he considered anyone from Nazareth as unfit for the work of God since this was one of those towns that was looked down upon by the Jews which is why he said, “Can anything good come out of Nazareth” (John 1:46). In this text he is referred to as Nathanael but is the same person as Bartholomew and when “Philip found Nathanael and told him, “We have found the one Moses wrote about in the Law, and about whom the prophets also wrote—Jesus of Nazareth, the son of Joseph.” “Nazareth! Can anything good come from there?” Nathanael asked. “Come and see,” said Philip” (John 1:45-46). When Nathanael or Bartholomew responded negatively about where Jesus came from Jesus said “Here truly is an Israelite in whom there is no deceit” to which Nathanael said “How do you know me” (John 1:47-48a)? Jesus replied “I saw you while you were still under the fig tree before Philip called you” then Nathanael seemed to quickly change his mind about Jesus saying “Rabbi, you are the Son of God; you are the king of Israel” (John 1:48b-49). Jesus then replied “You believe because I told you I saw you under the fig tree. You will see greater things than that.” He then added, “Very truly I tell you, you will see ‘heaven open, and the angels of God ascending and descending on’ the Son of Man” (John 1:50-51). This prophecy by Jesus would come true but not until after Jesus’ death and resurrection and perhaps could be seen to have occurred when Jesus ascended up into Heaven (Acts 1). Bartholomew would also later see Jesus after He was resurrected (John 21:2). Other than these accounts of Bartholomew or Nathanael, we have precious little mention of him in the gospels and the only accounts of him are mentioned in the Gospel of John. According to Ecclesiastical History (5:10) it was after the ascension that Bartholomew, like the majority of the other apostles, went on missionary trips but Bartholomew went much further than most of the other apostles, traveling to India like the Apostle Thomas did. He was said to have left behind a hand-written copy of the Gospel of Matthew which is interesting since that gospel is written primarily to the Jews and contains at least seven different Old Testament prophecies written specifically about Jesus. Popular church tradition says that after he went to India, he traveled to Armenia. (1) There he was thought to have met up with Jude Thaddeus where the two introduced Christianity. It is believed that it was while he was establishing Christianity in Armenia that he was martyred. Most biblical scholars agree that he was basically flayed to death by whips, where he was literally torn to shreds. There is not much else that is known about the way in which Bartholomew died, although we can imagine it involved a great deal of suffering as did the other apostle’s martyrdom. The exception was the Apostle John who is believed to have died of natural causes (age). Bartholomew or Nathanael, as one of the twelve apostles, went out into the world to preach the gospel to the whole world, each going out in different directions. Since the apostles went to various places, we might wonder if they had all discussed this before they left and decided where each of them should go. It would make no sense for several of them to go to the same places so it is believed that they each went into different parts of the civilized world and all but the Apostle John, died a martyrs death. They lived out their lives by the title that God had given each of them; an apostle, which means “one sent out” specifically by God. They took seriously the Great Commission (Matt 28:19-20; Acts 1:8) and obeyed Christ’s instructions, even paying for their commitment with their own lives. Thank you for educating us. I have wondered about the lesser known apostles. Thank you sir…you are always an encouragement. Previous post: Should A Politician’s Faith Matter For The Voting Christian? Next post: What Does The Bible Say About Reconciliation Between Believers?